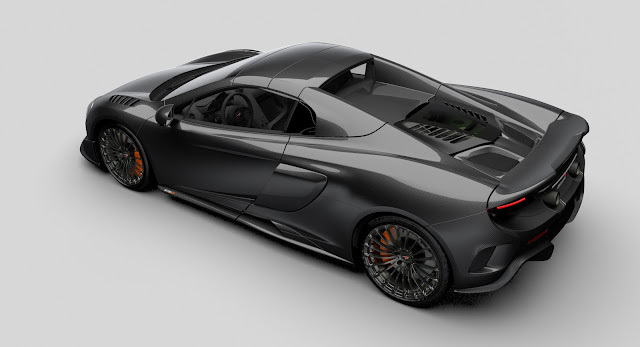 McLaren Special Operations, the bespoke division of McLaren Automotive, has announced the creation of the MSO Carbon Series LT. Strictly limited to 25 units globally – all already sold – and based on the 675LT Spider, the Carbon Series LT has been produced in response to requests from McLaren customers captivated by the visual carbon fibre bodied McLaren P1™displayed recently at the International Geneva Motor Show. Staying true to the ‘Longtail’ ethos, established by the McLaren F1 in the late 1990s, the MSO Carbon Series LT has been developed with a focus on light weight and optimised aerodynamic performance. 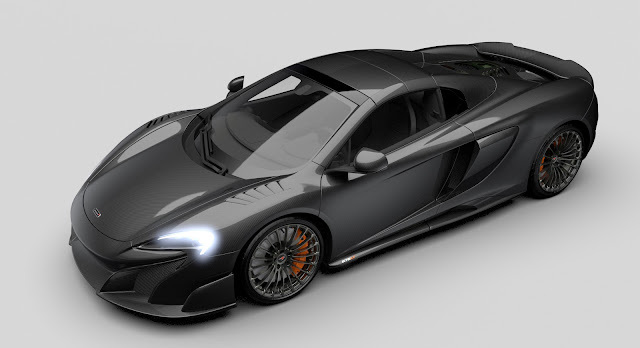 Applying gloss carbon fibre to the entire body of the car further extends its appeal to bring a brutal beauty to the existing 675LT Spider body, showcasing the skills of the McLaren bespoke division. As with the 675LT Spider, the front bumper with larger splitter and end plates, front under body, side skirts, side intakes, lower side intakes, rear bodyside lower, rear fenders, rear deck, rear bumper, diffuser and ‘Longtail’ Airbrake are all carbon fibre but with a gloss finish revealing the inherent weave of the material. In addition, the MSO Carbon Series LT is fitted with a gloss finished carbon fibre electrically retractable roof and tonneau, A-pillars, bonnet and rear deck, side blades, complete front and rear wings, and even fuel filler flap. The McLaren Track Telemetry pack, which includes three track cameras, is fitted as standard equipment. The front wings also feature GT3-inspired functional louvres. In total, the MSO Carbon Series LT features around 40 percent additional carbon fibre parts over the standard car, requiring significant additional development work by the team of MSO craftsmen. It is therefore not possible to retro-fit the gloss carbon fibre body to an already ordered 675LT Spider and the 25 units supplement the previously announced 500 editions of the standard car that sold out in weeks after the car’s debut on December 4, 2015. The MSO Carbon Series LT is only the third model to wear the LT badge. The first, the 675LT Coupé, arrived last year resurrecting the ‘Longtail’ name after nearly 20 years. The 675LT Coupé focused on light weight, enhanced aerodynamics, increased power and track-focused dynamics, and this limited-run model quickly sold out before the first deliveries commenced. Sharing these key characteristics, McLaren Automotive added the most focused, fastest and exhilarating open top model to ever wear a McLaren badge with the 675LT Spider, further strengthening the ‘LT’ brand. Under the gloss carbon fibre skin of the MSO Carbon Series LT sits the heavily-revised 3.8-litre twin turbo V8 powertrain from its Coupé sibling, ensuring performance figures are worthy of the LT badge. The power output and torque figures remain unchanged, with 675PS (666bhp) delivered at 7,100rpm and 700Nm (516lb ft) available between 5,000-6,500rpm. The changes to the powertrain saw more than 50 percent of the components replaced to ensure optimised levels of power, torque and drivability. These include new, more efficient turbos, detail design changes to the cylinder heads and exhaust manifolds, new camshaft and lightweight connecting rods, and a faster-flowing fuel pump and delivery system. Acceleration from 0-100 km/h (0-62 mph) takes just 2.9 seconds, and 200 km/h (124 mph) is achieved in 8.1 seconds – giving away only 0.2 seconds to the more aerodynamically optimised and lighter Coupé. Controlled torque delivery in first gear manages torque to 600Nm (443lb ft) to ensure maximum acceleration, and minimising wheel slip. Top speed is 326 km/h (203 mph). Production of the MSO Carbon Series LT begins this autumn with first deliveries expected before the end of 2016.